Oh backpack. How I’ve missed you. Well, I’m at it again. 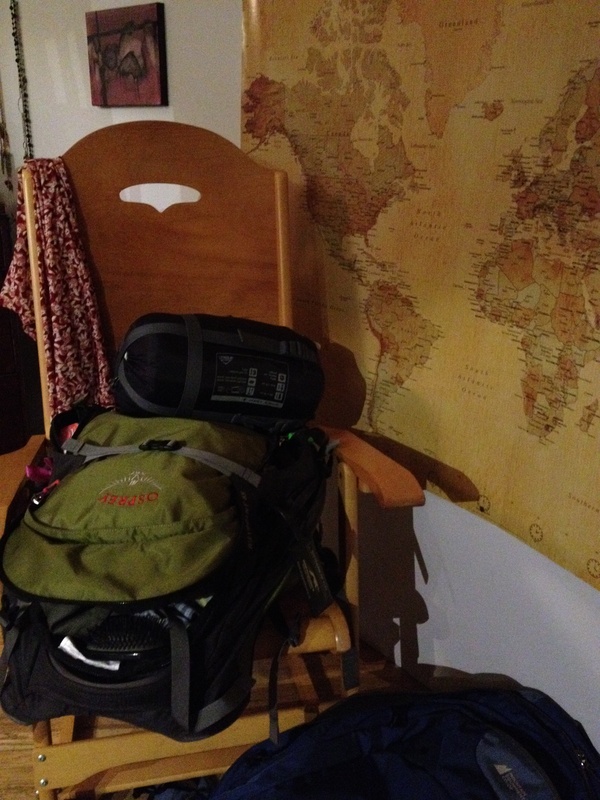 Packing for an adventure, that is. This time, I’m taking the TC with me and we are flying to South America to spend two weeks in Ecuador. This will be our first trip to the Southern Hemisphere, my first time travelling on a US airline, and South America will be the first continent I visit that I hadn’t already lived in (I lived in Europe as a child before ever going there to just travel). It’s funny that after over a year and a half of using the term TC (Travel Companion), my TC and I are finally going to be doing some major travelling worthy of the title. Our official reason for choosing Ecuador as our destination this year is that we want to see the Galapagos Islands (TORTOISES!) and even the untimely death of Lonesome George (George was only 100 years old, and the last giant tortoise in his subspecies, the Pinta) has not shaken our resolve (I would have loved to meet Lonesome George, but the other giant tortoises will hopefully cheer me up). So to the Galapagos we shall go, to spend a week living on a boat visiting various islands in the archipelago and having our minds blown by an amazing array of flora and fauna that can be found nowhere else in the world. Bookending our week in the Galapagos will be 3-night stays in Quito, Ecuador’s capital city. Since Quito sits at an elevation of 2800 m, travellers flying in from sea-level (like us) can often find themselves suffering from altitude sickness. For this reason, TC and I decided to stay in hotels in Quito’s Old Town (to put ourselves close to most of the things we want to see), and to really just take it easy as far as our plans for Quito are concerned. Depending on how the altitude affects us, a flight of stairs might cause me to require a lie-down, so we don’t really have much choice but to gauge how we’re feeling when we get there and plan around that. When I set out on my European Adventure last year, I was pretty anxious about the whole caper. This year, though of course I am visited by the usual worries of “what-if-we-miss-our-flights” and “what-if-we-lose-our-passports”, I’m feeling much better. I’m travelling for two weeks, not four. I’m not going alone this time. We’ve done most of our major planning (transportation, accommodation, etc.) already so we won’t be trying to plan and book things on the fly. As far as Ecuador-specific anxieties go, we’ll need to be vigilant about robbery (as travellers often do), and about trying not to get sick (let’s just say we’ve packed a big bottle of Imodium and are crossing our fingers like crazy). I don’t mind worrying a little bit, worrying sometimes keeps us smart. We’ll use our heads, I guess, and hope to be lucky. Worries aside, we’ve been so busy lately we’ve hardly had time to get excited. But we are. Deep down behind our tired frazzled faces. We take off early tomorrow morning. In the words of Doctor Who, “allons-y!“. It’s time for things to get awesome. P.S. No need to worry about Bunny. Our neighbour will be stopping in while we’re away to feed him and make sure he isn’t chewing the wall. But Bunny will, of course, be chewing the wall. Thanks John! We’ll keep that in mind! Have fun! The Galapagos is high on my list of places I really want to visit some day!